Who Needs A Map Anyway? Have you ever had one of those days? No, not one of those days, but you know, the kind of day where nothing at all goes as planned, but the day turns out better than you had expected? It all started when I woke up this morning. I felt refreshed, invigorated, and ready to tackle the day. My plan was to finish emptying out the garage so my wife could start turning it into her “studio” this week. There’s only about 2 hours of work left out there, so I figured I would begin around 2 and end by 4. That’s when the day itself completely turned on end. I received an e-mail at about 1:30 with a rare bird report. 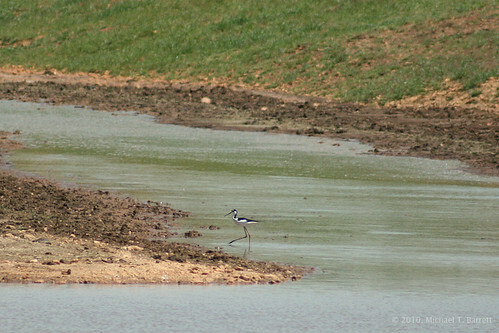 Apparently, there was a Black-Necked Stilt hanging out at a farm pond just 30 minutes north of us. I may have forgotten to tell you this, but the Black-Necked Stilt, until today, was my “goal bird”. The boys and I, in our bird-watching travels, each pick a bird for our “goal bird”. Meaning, our goal, whether it takes a day, a week, a year, or a lifetime, is to see that bird. Mine just so happened to be the Black-Necked Stilt. As you can see by the range map, they just don’t venture over toward our neck of the woods too often, so it didn’t take much convincing to pack up the scopes and head to Bartow County. The Black-Necked Stilt can be found around small ponds, lakeshores, and mudflats. It forages for insects, small fish, tadpoles, and other small food sources. According to the Cornell Lab of Ornithology, they have the second-longest legs in proportion to their bodies of any bird, exceeded only by flamingos. When we arrived at the farm pond on Brandon Farm Road, we saw the bird immediately. We didn’t need our binoculars to spot it, but the view through our scopes was absolutely amazing. The bird was resting on the shore of the pond for about 20 minutes, then it abruptly stood up, waded into the water and began feeding. Another 20 minutes later and it was resting back up on the shore. I never thought we would see this beautiful bird so close to home. The one thing I have learned, more than anything, since we have been birding, is that range maps are constantly changing. Whether it’s the climate, other enviromental influences, or some ecological puzzle yet to be solved, birds don’t read the range maps before they depart for their destination. I have more photos on my Flickr page, but remember, we were quite a distance from the Black-Necked Stilt, so the photos are not the best. We observed the bird for the better part of an hour, then we had to venture back down the road so we could get some other errands done before it got too late. We ran a few errands and as the sun went down, I started to get a headache. I’m not sure if it was the excitement of the day, the pollen in the air, or just fatigue, but regardless of what caused it, I am not going to let a headache ruin an otherwise perfect day. As I wrap up this post this evening I realize it’s time to choose a new “goal bird”, and I have no idea what I am going to pick this time. Got any ideas? You must have got a Stilt neck Michael!!! hahaha! Wow great goal bird…I should get one of thoes! Not sure what your next one should be. My favorite northern bird is the Clay-colored Sparrow…have you gotten that one yet? They buzz!! I am still debating which bird to choose, but when I do, I will definitely be writing about it.